The Colorado River from Glen Canyon Dam to Lees Ferry boat ramp is 15 miles of crystal clear water, with breathtaking views of sandstone cliffs up to 1000 feet and water temperatures averaging 48-50 degrees, offering outdoor enthusiasts an outstanding and exceptional experience at the gateway to the Grand Canyon. Kayaking, canoeing, and stand-up paddle boarding offer the ability to see the river at your own pace. 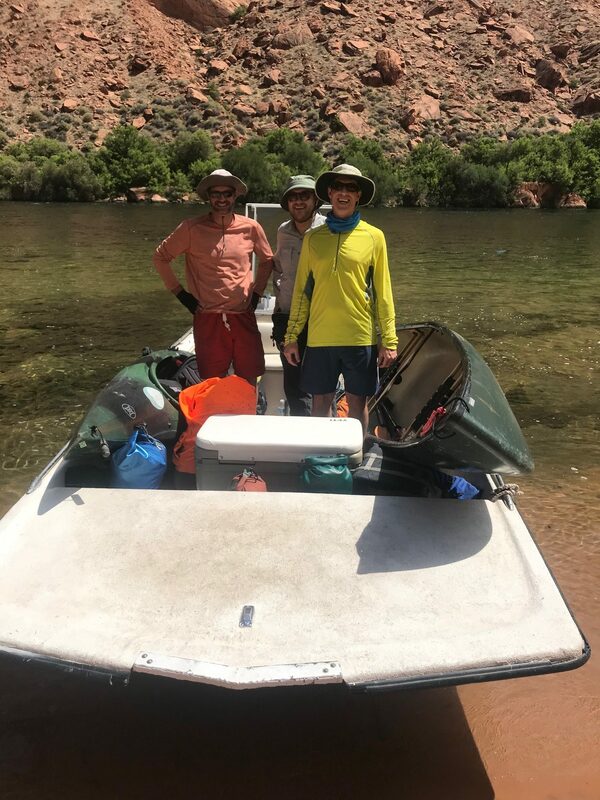 Lees Ferry Backhaul is your go-to resource for backhaul/shuttle service and guided river tours on the Colorado River at Lees Ferry. The road to Lees Ferry is just west of the Navajo Bridge in Marble Canyon, AZ. There is a Park Service kiosk approximately ¼ mile in on the right where you can get your Park Pass for your visit. I’d recommend getting the pass, as the rangers will cite vehicles that don’t have the pass displayed. Don’t speed on the road in to the boat ramp! There are a number of government agencies with jurisdiction in the area and they are serious about the speed limits on the road. Speed limits vary from 45 mph to 25 mph and it’s easy to get caught up in the scenery and excitement about getting to the river and boat ramp. Watch your speed! Day parking is available in the parking lot at the boat ramp and long-term parking is a short walk back towards the highway. Any vehicle parked overnight should use the long-term lot as rangers do monitor the parking area. The rangers are friendly and courteous but they do follow the rules and expect visitors to cooperate. Put your cell phone on airplane mode. If your phone is not on airplane mode it will continually search for a signal and drain your battery faster. Service is spotty at best, and you’ll be able to relax better if your phone is not alerting you about emails, texts or calls. Additionally. Give yourself a well-deserved break from technology and enjoy the magic of the Canyon Experience! (Your camera will work in airplane mode) Anyone floating with you will appreciate the quiet. Canyon Sights, Wildlife, Views, Serenity, oh my! Starting with Glen Canyon Dam, this stretch of the Colorado River is Amazing! The best tip I can offer is to relax, breathe and take your time as you look around at all the amazing sights. Wildlife includes Osprey, Eagles (both Golden and Bald), Ducks, Geese, Herons, Condors, Falcons and Turkey Vultures, and that’s just the birds! Don’t forget to look down at all the trout! Bighorn Sheep are regularly seen on the river, as are wild horses, beavers (though mostly nocturnal), and otters. Watch for movement on the canyon walls as bighorn blend in with their surroundings, but have white backsides which are spotted when they move. Look up regularly and you’ll likely see these amazing animals climbing ridiculously steep terrain. Petroglyphs Beach is at mile 10 on the left and is highly recommended. The petroglyphs are approximately 200 yards from the river, past the 4 outhouses. Just follow the trail. Horseshoe Bend has become quite the popular viewpoint as the internet can attest. Most people see it while looking down from the top. You’ll get to see it from the bottom up, and be sure to smile, as you’ll likely be in someone’s photo from above. There are countless examples of remarkable rock formations on this stretch of river and many people report seeing faces and animals in the rocks. Finger Rock, at mile 7 on your left is easily seen. The river flows at rate of 2.5-4 miles/hour and the 15 miles stretch can be experienced in one day or you can camp at one of 5 campgrounds on a first-come basis. There are several hikes listed below under the Hiking section. Finger arch can be seen at mile 3.5 on the left, approximately 1/3 of the way up the canyon wall. Wild horses can regularly be seen on the left side of the river 1-2 miles up from the boat ramp. At the last turn before the boat ramp, be sure to check out the wreck of the Charles Spencer steamboat. It will be on the right and is visible at flows less than 15,000 cfs. Look for the path above the river where you will see the back of a trail sign. The steam boiler will be most visible, but if the wind isn’t blowing, you can see the outline of the ship below the water line. There are 5 campgrounds on the 15 mile stretch of river. (There were 6 but one was closed last year after someone blew up the outhouse!) Some have names, but most are known for their distance from the boat dock. There is also a campground at Lees Ferry which you will pass as you drive to the boat dock. (This is the only campground that requires a fee.) All up river campgrounds are first-come, with no reservations. Ropes Trail Campground – is on the right at mile 14. This campground gets less use than others downstream but offers more privacy. It does have a steep climb from the river, and remember to secure your personal watercraft as winds can happen unexpectedly. It has an outhouse, fire pits, several camp sites and petroglyphs behind the outhouse. Ferry Swale Campground – is on the left at mile 11. This is a popular campground with an outhouse and fire pits and can accommodate several camp sites. Nine Mile/ Horseshoe Bend Campground – On the right in the middle of Horseshoe Bend. This is another popular campground with good facilities and fire pits. Expect crowds to be looking down on you from the top of Horseshoe Bend, so if looking for privacy, this may not be your best choice. 8 Mile Campground – On the right just downstream from Horseshoe Bend, this site offers more privacy than others. It is higher than the river which requires a brief climb. Be sure to secure your watercraft from wind. This also has fire pits and an outhouse. 6 Mile Campground – On the right, this is the last campground available and offers fire pits and an outhouse. The Lees Ferry stretch of the Colorado River is a high desert climate, with normal daily temperature fluctuations of 25-30 degrees. It’s normal for summer day time temps to be 100 degrees and night temps to be 70 or even less. Even during summer it’s a good idea to have a sweatshirt for cool mornings. When planning water supplies, either pack a filtration device or plenty of water. Drinking the river water is not advised, and the natural springs that are available are on the upper part of the river, typically upriver of campground locations. Wind gusts are common on this stretch of river, especially in the Spring. If possible, move your personal watercraft to the windward side of the river (the direction the wind is blowing from). This will be much easier paddling than the leeward side. It’s common that the wind will change direction depending on where you are on the river, so expect to move back and forth across the river. Channel/visibility – the 15 miles of river from Glen Canyon Dam to Lees Ferry boat ramp has many areas where the water depth is too shallow for many boats to safely navigate outside the “channel”. Just because the river is wide does not mean that boats have unlimited ability to navigate safely around personal water craft. Be aware of this and wherever possible, use the edges of the river. Additionally, when light conditions are low, as during early morning and late afternoon, it is very difficult for boaters to see personal watercraft. Many boats travel this stretch going 30 miles per hour which means they’ll be dangerously close quickly. Most boats can be heard by personal watercraft a half mile away, so when you hear a boat coming, move to the side of the river. Water temp –The good news: it’s refreshing! The bad news: it’s Cold! 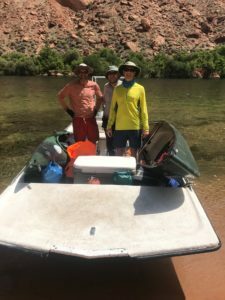 Because the River flows from the bottom of Lake Powell at the base of Glen Canyon Dam, year round water temperatures are normally approximately 48 degrees, which is too cold for most people to swim. Hypothermia will start within 5 minutes with a loss of dexterity. Wear a personal flotation device (PFD) to improve your ability to get safely back to your kayak, paddle board or canoe and keep your head above water. Ropes Trail- Located at Mile 14 (on the right), and marked by the Ropes Trail Camp Ground sign, this is the only spot on the river where you can hike from the river to the top of the cliffs. It is considered a difficult hike and don’t forget to bring water. If you don’t want to work too hard to climb to the top, there’s a cool petroglyph panel on the canyon wall behind the outhouse. 10 mile- Petroglyphs Beach- This on the left and includes 4 good outhouses, and a short hike of approximately 200 yards to a petroglyphs panel that is awesome and well worth the short hike. Just follow the path and please obey all rules. 4 Mile- Water Holes Canyon, on the left. Make sure you pull your watercraft well out of the water, as winds can gust unexpectedly and blow your craft down river. No fun there. This is a fairly short hike to a 500 foot dry waterfall. 2.5 Mile Bar- Fall Creek/ Echo Cliffs- Hislop’s Cave, all on the left side of the river. Again, make sure you pull your craft well out of the water in case of wind gusts. The best route to get to Hislop’s Cave is to follow the creek (dry most of the year) for approximately 150 yards until you see a small cairn on your left. This marks a lightly traveled trail up to the cave. Or continue to follow the creek bed as far as you like. There are many cool rock formations in this area; be sure to look up regularly! As with everything in the Grand Canyon area the adage “Take only pictures; leave only footprints” applies. When packing, please remember to pack trash bags to remove everything you’ll use/consume on your trip. When you get back to the boat dock there are several dumpsters available. Lees Ferry is known for fabulous trout fishing and beautiful wild rainbow trout can be seen throughout this stretch of river. Both spin fishing and fly fishing are productive. For spin fishing, try natural color plastic worms 2’ below a weight and bounced off the bottom. Also try Panther Martin, Kastmaster, Rapala or other lures. Fly fisherman should include in their fly box: ginger colored scuds, various midge patterns, San Juan worms and olive wooly buggers. Lees Ferry is named after John Doyle Lee, who was commissioned by Mormon Church leader Brigham Young to establish a river crossing at the current site in 1871. The ferry was operated by several men from 1871-1929, when it was made obsolete with the construction of Navajo Bridge in 1929. There are several historic building at Lees Ferry including the Lonely Dell Ranch and orchard and Lees Ferry Fort. There are several backhaul providers available to take you up river. Costs are usually similar, and services vary from basic backhaul to a canyon tour with hiking recommendations. Some providers offer rental options for kayaks or paddle boards. Expect the basic backhaul to take approximately 30-45 minutes to get from the boat dock to the dam drop-off area.